London (AP) – London is under Harry Potter’s spell once more — and J.K. Rowling hopes the rest of the world will eventually follow. The stage play “Harry Potter and the Cursed Child” had its gala opening last Saturday in London’s West End and is already the theater event of the year. 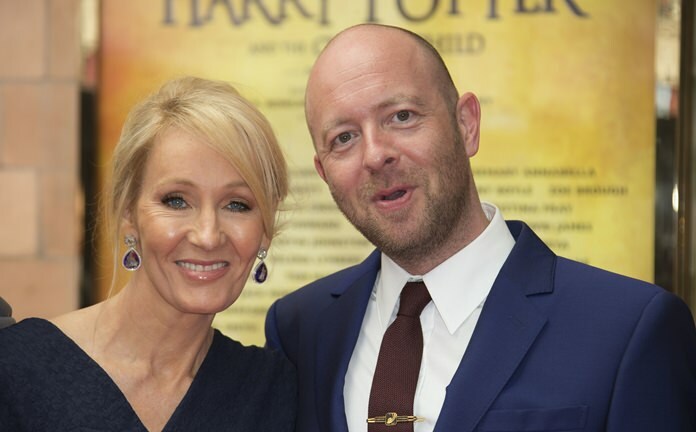 Rowling joined director John Tiffany, playwright Jack Thorne and the cast onstage to receive a raucous standing ovation at the end of the two-part show at London’s Palace Theatre, where it’s scheduled to run at least until December 2017. If the boy wizard’s creator has her way, that will only be the beginning. “I’d like as many Potter fans to see it as possible,” Rowling said on the red carpet before the show, as fans cheered and poked camera phones over crowd barriers in hope of getting a picture. The script of the play was also published last Sunday, with a global print run in the millions, so future audiences will have more opportunities to know the plot in advance if they choose. Without entering spoiler territory, it’s safe to say that the play has much to make fans rejoice. This is both an eighth installment in the Potter saga worthy of Rowling’s seven novels, and a stage spectacle to delight even the uninitiated. Harry — the orphaned boy whose destiny was to save the wizarding world — is now an overworked civil servant at the Ministry of Magic, feeling the approach of middle age. His younger son, Albus Severus, is a reluctant pupil at Hogwarts School of Witchcraft and Wizardry, struggling with the burden of his family’s fame. Fans who know the saga inside out are likely to appreciate the teeming detail of the play, which runs for five hours over two parts. It captures Rowling’s richly textured magical world, with its byzantine mythology, complex history and array of fantastical creatures. The plot is a rollicking adventure in which Albus’ attempt to right a wrong goes awry. But it also has adult things to say about loss and grief, and about the complexities of friendship and family love. The cast is anchored by the adult trio of Jamie Parker as Harry, Noma Dumezweni as Hermione Granger and Paul Thornley as Ron Weasley. There’s also a touching performance from Sam Clemmett as Albus, and an engaging, career-making turn from Anthony Boyle as Scorpius Malfoy, the surprising son of Harry’s childhood enemy Draco Malfoy. The actors draw both laughter and tears from audience members. But it’s the work of the production crew that elicits gasps, with illusions that appear simultaneously simple and inexplicable.